As much as I’d like to claim to be a Pinterest Mom (you know what I’m talking about ) I am so totally not. Though I do have it together more then some I know, sometimes I feel like I am flying by the seat of my pants. Literally. You know the days where you’re just not sure what’s going on? You wake up and you think it’s Saturday yet it’s only Thursday? You rush to get ready, to find out one of the kids needs to be to school early and another just has to ride the bus, and you forgot to pack lunches? That is until I saw a teacher friend of mine post “Who ever came up with starting back to school this early was nuts” – upon further investigation I found out that school no longer starts August 28th, but August 13th!!! Yeah, it was one of those moments. So my action plan needed to be expedited immediately. I no longer had 6 weeks of prep, but now 3! This year I am determined to be the Pinterest Mom we all dream about (or at least partially). Here are some great tips from WebMD to get prepped for back to school without the stress. Use the last few weeks of summer to get into a school-day rhythm. “Have your child practice getting up and getting dressed at the same time every morning,” suggests school psychologist Kelly Vaillancourt, MA, CAS. Start eating breakfast, lunch, and snacks around the times your child will eat when school is in session. Once the classroom door shuts, your child will need to manage a lot of things on his own. Get him ready for independence by talking ahead of time about responsibilities he’s old enough to shoulder. This might include organizing his school materials, writing down assignments, and bringing home homework, says Nicole Pfleger, school counselor at Nickajack Elementary School in Smyrna, GA. Even if your child is young, you can instill skills that will build confidence and independence at school. Have your young child practice writing her name and tying her own shoes. “The transition to school will be easier for everyone if your child can manage basic needs without relying on an adult,” Pfleger says. “Parents and teachers should do whatever they can to facilitate a child being responsible,” says Pfleger, who was named School Counselor of the Year by the American School Counselor Association in 2012. At home, you can designate a spot where school things like backpacks and lunch boxes always go to avoid last-minute scrambles in the morning. You might also have your child make a list of things to bring to school and post it by the front door. Head off daily battles by making homework part of your child’s everyday routine. Establish a time and a place for studying at home. “Even if it’s the kitchen table, it really helps if kids know that’s where they sit down and do homework, and that it happens at the same time every day,” says Pfleger. As much as possible, plan to make yourself available during homework time, especially with younger kids. You might be reading the paper or cooking dinner, but be around to check in on your child’s progress. School gets out before most working parents get home, so it’s important to figure out where your children will go, or who will be at home, in the afternoons. You might find an after-school program through the school itself, a local YMCA, or a Boys and Girls Club. If possible, try to arrange your schedule so you can be there when your child gets home during those first few days of school. It may help your child adjust to the new schedule and teachers. Working parents also know the trials and tribulations of getting a call from the school nurse when they can’t get away from the office. “Most of our parents, because of the economy, are working,” says Pfleger. Before school begins, line up a trusted babysitter or group of parents that can pinch hit for each other when children get sick. And make sure you know the school’s policy. You may have to sign forms ahead of time listing people who have your permission to pick up your child. Schools typically hold orientation and information sessions before the start of each academic year. These are good opportunities for you to meet the key players: your child’s teachers, school counselors, the principle, and most importantly, front desk staff. “The secretaries know everything and are the first people children see when they arrive at school every day,” says Vaillancourt. Together, you and your child can plan for success in school. For instance, sit down with your child to create a routine chart. Ask your child what she wants to do first when she first gets home from school: play outside or do homework? Her answers go on the chart. “The more kids have ownership in creating a routine for themselves and setting expectations, the more likely they are to follow it,” says Vaillancourt. The first day of school is no time for a drastic adjustment of household sleep schedules. Instead, ease children back into a school year routine gradually. During the last two weeks of summer, re-introduce a school year bedtime. Begin waking late sleepers earlier and earlier, closer to the hour they’ll need to rise when school begins. Paper planner fans dedicate a planner section to serve as Calendar Central, while tech-savvy cybergrrrlz store the info in a smart phone or tablet and sync with multiple computers. Choose a calendar format that works for your family. An informed shopper is a savvy shopper, so prepare before you shop. Take an afternoon and assess each child’s clothing needs. Empty drawers and closets of outgrown or worn-out clothing, and either store or donate the discards. School entry may require documentation from immunization records to report cards from the previous school year. Athletes need proof of medical examination. A little preparation can prevent frantic last-minute searches for a birth certificate or registration confirmation. Call your child’s school or check the school district Web site beforehand to find out what paperwork will be required–then find it! You won’t be sorry come registration day. How are school mornings in your home? Crazed and chaotic, or calm and cheerful? Plan ahead to send your schoolchildren–and yourself!–out the door in a happy frame of mind. Each evening, think ahead to the following morning; where can you lighten the load? Set the breakfast table as you clear the dinner dishes, and make sure breakfast foods are easy to reach. Lay out children’s clothing the night before. Scan backpacks or launch pad spaces for missing homework, projects or library books. Make sure musical instruments or sports bags are packed and ready to go. Do “bathroom wars” break out daily among the small fry? Multi-child households may need a bathroom schedule so that everyone gets equal time before the mirror. What do you do about books and papers, lunch money and permission slips? Practice the Launch Pad concept! By creating a dedicated space for every family member, a Launch Pad gets the family out the door in record time–and organized. How will children get to school? The first day of school is no time to find out it takes ten minutes–not five–to walk to the nearest bus stop! Before school begins, make a practice run to get children to the school on time. If they’ll walk, help them learn the route they’ll take and note the needed time. Car-pooling? Make sure the dry run accounts for early-morning traffic! Bus riders will need to be familiar with the location of the bus stop; print and post the bus schedule to prevent a missed bus. Clean house … fast! Take a stab at speed cleaning and whip through household chores in record time. Streamline dinner preparations. Try a session of freezer cooking to stock the freezer with prepared entrees for stress-free dinner on sports night. Happy New School Year! Time to swing into a new school year–from an organized home. 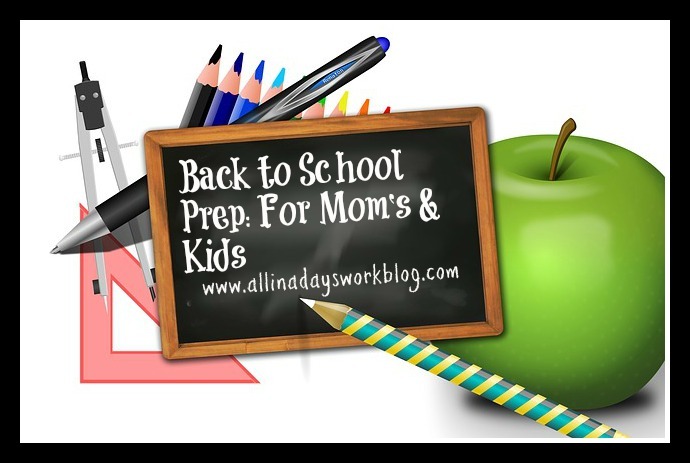 What is your favorite “Back to School” tip??? This entry was posted in Cleaning & Organizing and tagged back to school. Bookmark the permalink. Oh boy, I know it’s just around the corner, but I don’t want to think about this yet. I’ll pin it for future reference. LOL!